Note: This is an archival review. I have since seen the movie with a more open mind than I had when the movie was released. I will write another review in the future to express my feelings of the movie now. 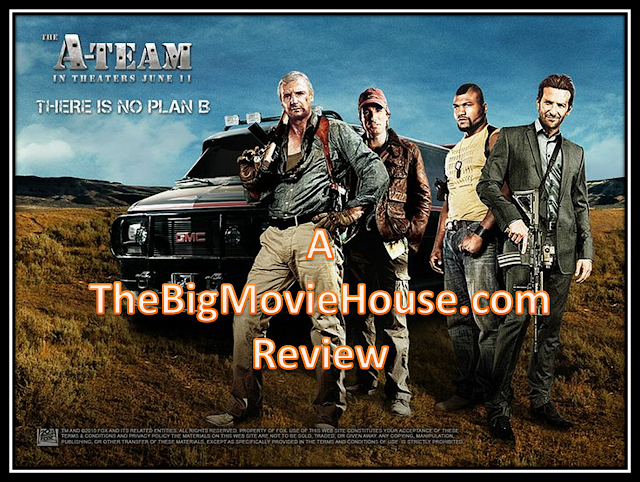 The big screen version of the 1980's hit show The A-Team is an assembly line kind of movie. There is nothing original or exciting to be found here. Just standard issue parts with no customized detail. The movie begins with the oh so wacky introductions to the characters. Liam Nesson is seen getting beat up. The men who are beating him up leave, but before doing so, they sick two dogs on him. Neeson removes his handcuffs, grabs a gun, and disappears into the shadows. The dogs follow. But Neeson doesn't kill the dogs, he merely handcuffs them together. It would have been better him he had to fit the dogs off, but this movie is too dumb for that. I guess it is more badass to handcuff the dogs rather than to fight them. The introduction to the rest of the crew is similar in its wackyness. The character that Mr. T played in the tv show (he will be referred to as "Movie Mr. T") is shown fleeing cops in a sports car. He loses them rather quickly and enters a garage. It is apparent that he has stolen this car for someone. That someone tells Movie Mr. T that he can not have his "baby" back. Movie Mr. T gets mad and beats up everybody in the garage. After doing so, it is revealed that his "baby" is the A-Team van. The other two characters are introduced in "funny" ways. Bradley Cooper is about to be set on fire when Neeson and Movie Mr. T show up and saves the day. The last character is Murdoch, the only name I remember. He is played by the guy from District 9 and is a mental patient who happens to be a good pilot. After their daring escape, we flash foward four years. The team is stationed on a base in Bahgdad. There is a local bad guy who has U.S. Mint plates and plans on smuggling $1 billion out of Iraq. The A-Team is warned that if they go after the bad guy they will be court marshaled. They take the job and are soon court marshaled for entirely different reasons. They break out of jail and are soon on a quest to clear their names. The main problem with this movie lies at the screenplay level. In a normal action movie the lead characters have to work for their freedom, to clear their names, etc. Here it seems that almost everything is handed to them or made easier. There is no suspense on display here. Take, for example, the scene where the A-Team has to break Murdach out of a mental institution in Germany. They send a package to him with a bunch of pairs of 3-D glasses. Murdoch takes all the patients into a room where they are going to watch a 3-D movie. The movie starts and the A-Team theme starts playing, but the movie that they are watching is The Great Escape, a movie that is NOT in 3-D. A truck is seen on screen driving towards the screen when all of a sudden a truck, carrying the A-Team crashes through the wall the movie is being projected on. The team grabs Murdoch and drives away. You see how easy it was to get him out? You would think that there would be guards around him since everyone in the movie knows that the team is coming for him, but no. They just have him among the regular patients. This is just lazy writing. The whole movie is like this, where the team goes through the bare minimum to get what they need. There is another scene in the movie that slapping my forehead and saying, "what?". You know the game where you have three cups and you put a ball underneath one of the cups, then you move the cups around and the person has to pick which cup he thinks the ball is under? Well they do that is this movie, but with those big ship cargo holders. How is this even possible? I am a man who can suspend disbelief to an extreme degree, but this is going a little too far. 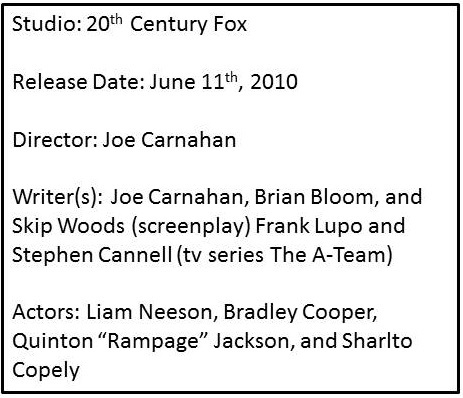 The movie is directed by Joe Carnahan, who also had a hand in the writing of the script. I was going to give him a pass on the directing until I saw that he also wrote this thing too. The movie is good to look at, but that is about it. Carnahan has shown before that he knows how to handle a movie. He directed Narc which I named the best film in the year that it came out. It seems that he is getting away from that and is now trying to give us something that is "cool". 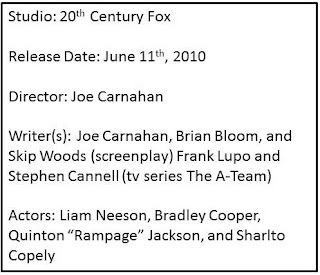 He also directed Smokin' Aces, which I thought was a terrible movie, save for Alicia Keys. The A-Team is a movie that is trying so hard to be "cool" or "badass", but doesn't even know what the definition of either word is. There was not one moment in the movie where I was amazed or even thrilled. The A-Team joins The Prince of Persia and Iron Man 2 as the worst the summer of 2010 has to offer.